Rules To Live By Rules. They’re everywhere, public roads, restaurants, schools, and even sporting events. Rules are needed to keep chaos to a minimum and to create a safe environment. This school year, Valley Heights has revised its student handbook and instituted new rules. Rule changes are made through the staff, the issues are discussed and voted on. 80% of the staff must approve in order for the rule to be changed. A goal for this year was to enforce rules from the handbook consistently. An example this is the vending machines. This year, the vending machines are turned off from 8:05 AM to 3:35 PM. With students wanting to be able to eat snacks throughout the day, this has caused turmoil amongst them. 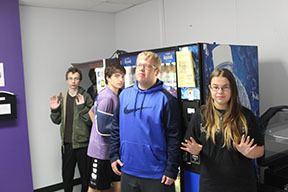 According to Valley Heights Principal, Chad Kenworthy, “The vending machines had been in the handbook prior to my arrival, but maybe not enforced very strongly.” Another new policy would be our hall pass policy. Students are granted 32 hall passes every half semester. These are used whenever a student leaves the class. Once the 32 passes are used, the student is no longer allowed to leave any classes until the next quarter. This means a student can leave the class at an average, 3 times a week. Kenworthy wanted to add that “Some of these changes may be new to Valley Heights Jr/Sr High School community, but it is common in other schools I have worked in.” Valley Heights Students are now being held to a higher standard. Although these rules may cause concern among the students, they must learn to adapt just as they would for a job.